Fingerless mitts season is upon us. Finally! For anybody who is wondering what the fuss is about, and also Dad, I’m here to help. Functional. 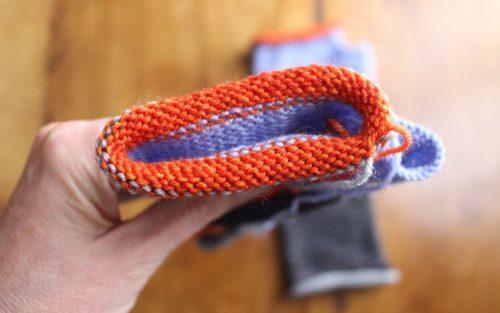 If you spend any time on a computer, or a lot of time on a computer—and your computer is located next to an uninsulated window—fingerless mitts make a lot of sense. I wear them all winter long. They are also good when you’re on the go—getting the emeralds out of the safe deposit box, performing lasik surgery, lacing up your over-the-knee stiletto boots. Fast. They crank so easily, and with so little problem. If a sock fills you with dread, this is a sock with no heel. Whimsical. 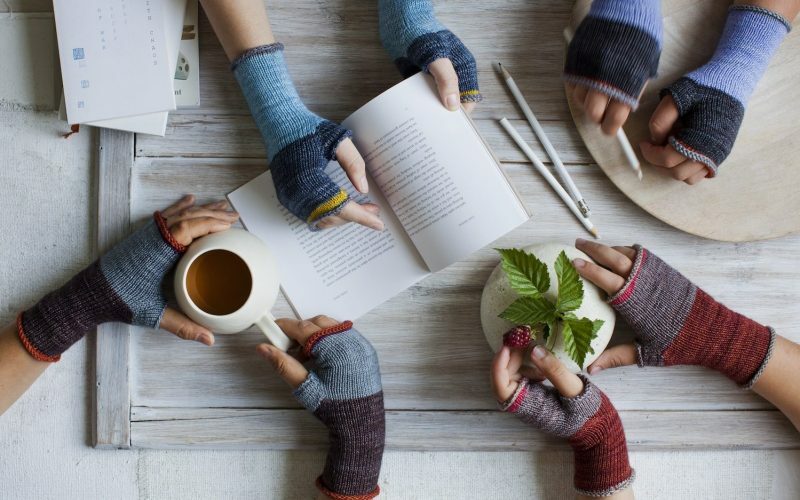 Life seems 2 percent more joyful when you’ve got the fingerless mitts on. Easy or hard. The stakes are low, so you can take a chance on cables, Fair Isle, or impossible stitch patterns. Experimental. You can make them endlessly colorful or plain. I was the one who agitated loudest for fingerless mitts in Mason-Dixon Knitting Field Guide No. 1. If nothing else ever appears in a Field Guide, I needed to know that I would have a solid fingerless mitts pattern. When Ann Weaver‘s pattern appeared, we knew it was great. 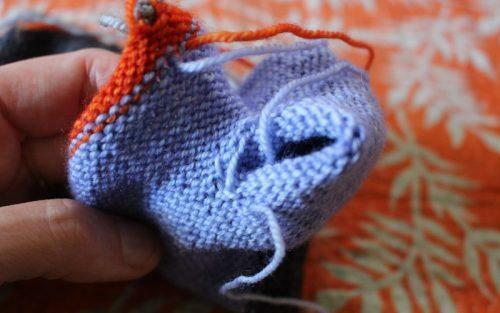 Ann’s interest in color theory is at work in these mitts—the slim stripes are so interesting. Her sample was made with Wendee Shulsen’s Hazel Knits Artisan Sock yarn, which I’d never heard of before and was happy to discover. This yarn quickly became our choice to pair with these mitts. And once Melanie Falick, creative director and editor of the Field Guides, figured out the colorways, I knew that Squad Mitts would be my go-to multiple of the year. You have to understand, I’ve just come off a weekend where there was a lot of yarn to admire. 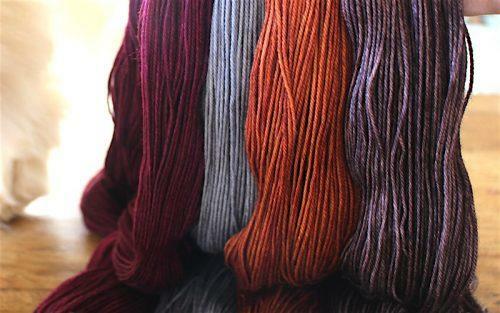 But I’ve spent a while today looking at all 4 colorways of this yarn—16 shades—and they’re all so lovely. I see mitts, but I see all sorts of shawls and sweaters and blankets. You could make a batch of mitts and have yarn leftover for coordinating hats. Or socks. MDK friend Francie is making Stephen West’s new Mystery Shawl KAL 2016 with this yarn and is having a fine time. 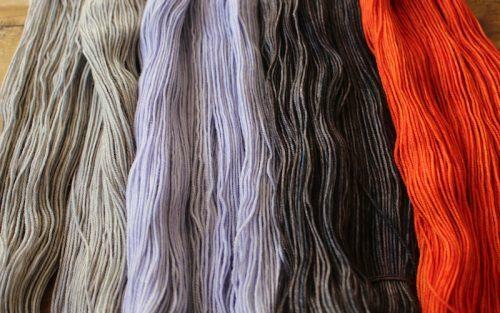 It comes in 400-yard skeins that will make 5 pairs of Squad Mitts or even more. But that doesn’t seem out of whack to me. I’m already on my third pair. I’ve memorized the pattern. Oh, man. My field guide #1 arrived today. It is unequivocally perfect. Thank you. Thank you for bringing Stephen West’s designs to my attention- it’s like Elizabeth Zimmerman meets Ziggy Stardust – love it! That is the most perfect comment I think I have ever read! Finally the perfect description of Stephen West! Your description is spot on! His patterns are a joy to knit. I can see how addictive these would be. I’ve only made one pair of fingerless mitts to wear as winter photography mitts. I made the palm part long enough to be warm folded up as regular mitts or “full-length” to extend past my fingertips if my fingers got cold. They didn’t keep my hands as warm as gloves or mittens, but they did allow me to make exposure adjustments on the cameras without pulling gloves off and on every two minutes. I will be finishing up my first pair today. I’m so happy to have a really good fingerless mitt pattern. They’re for my husband who works in a cold office. My Hazel Knits yarn (Squad Mitts Kit colorway 2) Is knitting up wonderfully in the Westknits Mystery Knit Along! I knew the kit was perfect as soon as I saw it. 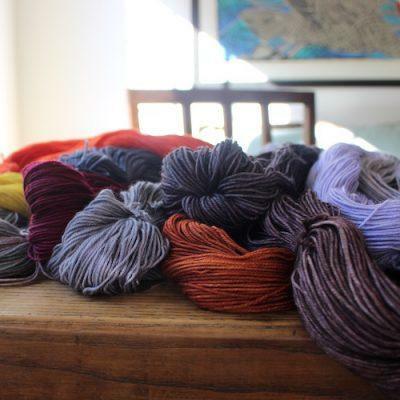 The MKAL called for four colors, 400 yards each and that is exactly what these kits are. 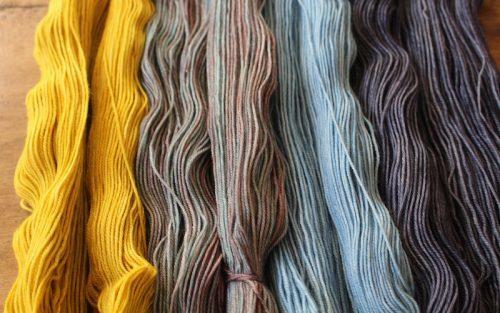 All of the colorways are fabulous but the Lichen (charteussy yellow) was calling my name. The two shades of gray really make that color pop. I plan to make some mitts with the leftovers. When in shops fondling treasures you don’t have to take off your mitts leaving them behind as I have done many times. Time for a few pairs of those up here in Canada. I’ll have to order myself a Field Guide. It’s a great use of a skein of luxurious soft and cozy yarns, like (ahem) cashmere or a silk/wool blend. Perhaps with sequins. I just love the color combinations. These are fashion statements, not just hand warmers. Have been “collecting” Hazel Knits sock yarn for sometime. Perfect pattern! Such cute mitts! Yes it would be easy to make many pairs which would be very well-received. I can highly recommend Susan Rainey’s No End Stripe techniques. Completely changed my approach to striping! I like that safety pin trick – so simple! can’t believe I never thought of doing that! I’m having a “thing” with fingerless mitts myself right now. They are amazing. People appreciate the “being able to text while wearing mittens” thing. Try in a chunky weight and they really fly. I’ve made two pairs of Vancouver Fog, a Reading Mitts and now currently chugging along on Clara Parkes “Maine Morning Mitts”. I love your pattern too! It will be next. BTW – at Old Sturbridge Village (1830’s old timey recreation village that is amazing) I learned that back in the day Muffattees (similar!) were worn because they believed that keeping the wrist warm kept the blood warm and that warmed the body. Also because of all the work they did with fire, animals etc. made the fingers wear out to quickly. Hey, Hazel Knits yarn is from my corner of the world! I’m lucky enough to have access to it in person at my semi-local yarn store, Stash LLC in Corvallis, OR. I’m looking forward to your book, and this pattern. Perfect timing for the fall! Where is the pattern? Am I missing a link?